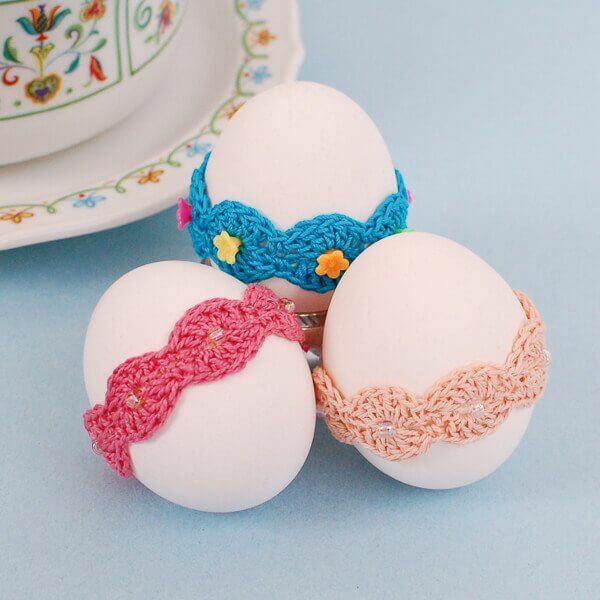 I have to share my new favorite way of decorating eggs … these pretty lace wraps! They are a quick, no mess way of creating charming Easter decor … and best of all you can use them again and again every year. 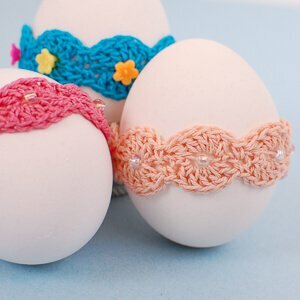 For more free crochet Easter decor, check out my free Easter crochet patterns here. Finished wraps measure approximately 5 in. × ¾ in. and should fit most extra large eggs. Using a sewing needle, string all 7 beads onto crochet thread before beginning. 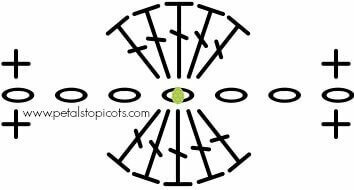 Ch 3, pull 1 bead up to hook and ch 1 enclosing the bead, *ch 5, pull next bead up to hook and ch 1 enclosing the bead, repeat from * 5 more times, ch 4 — 44 ch. Round 1: Beginning in 2nd ch from hook, *work 1 sc, skip next 2 ch, 5 dc in next ch, skip next 2 ch, repeat from * 6 more times, work 3 sc in last ch; rotating piece to work across opposite side of beginning chain, **skip next 2 ch, 5 dc in next ch, skip next 2 ch, 1 sc in next ch, repeat from * 6 more times, work 1 sc in same st as last sc was made, join and fasten off — 88 sts. Weave in ends with a sewing needle. Use removable glue dots to adhere wraps to hard boiled eggs (see supply links below). It would also make a cute bracelet for some little girls too. 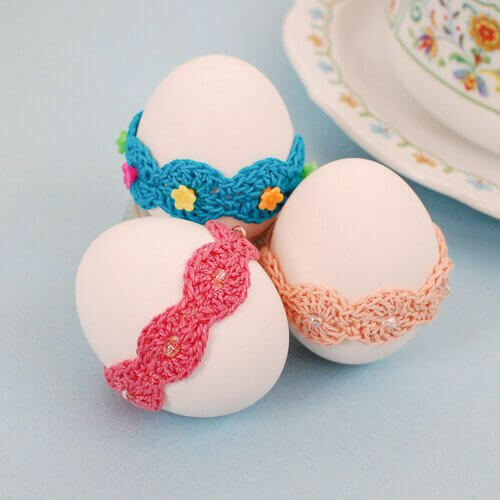 Would make a cute Easter headband!